Elizabeth began her career as an equity analyst and brings a deep understanding of how to unlock value within companies, big and small. Almost all professional sports have betting activity (professional football being the most popular), and the type of betting varies. 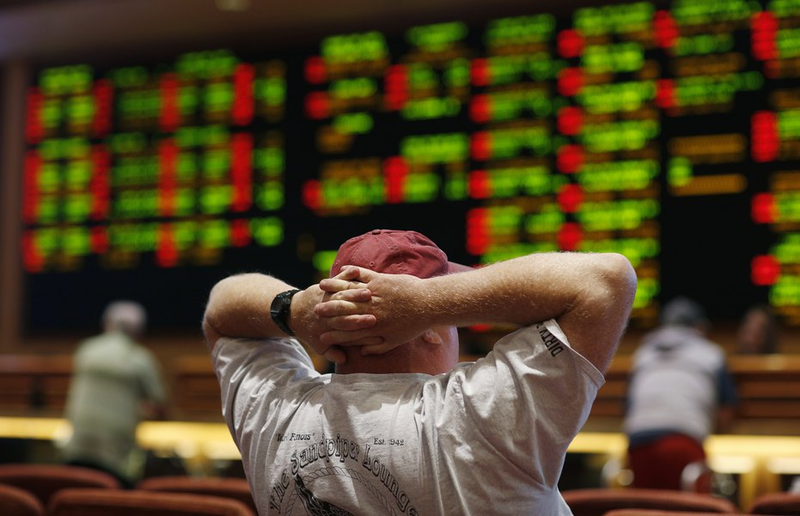 Betting can extend beyond simply choosing winners and losers of a game (the "money line") with bets on the "point spread," the "total]," parlays, and futures. Sports betting is legal in many parts of the world, with the largest legal market in the UK. There are $1.8 trillion illegal wagers worldwide, largely in unregulated markets and on illegal betting websites. Over 80% of sports bets are placed on the black market globally. In the US alone, illegal sports wagers are estimated to reach between $50 to $150 billion. Nevada, the only US state that had allowed sports keepers, recorded $4.8 billion in 2017. Britain, with a population of 65 million and a far less diverse sports market, yielded $20 billion in wagers for the 2017 fiscal year. The ruling applied to a case brought by New Jersey, which could be implemented shortly. Though the other states could allow sports betting, they will need to consider the issue for themselves. States have an incentive. If passed in 40 states, it could generate $8 billion in local taxes, create hundreds of thousands of jobs, and add $20 billion to the GDP. However, there will be many licensing, taxing, and potential demands from leagues to sort out. What is the appropriate tax rate? Nevada currently imposes a 6.5% tax, Pennsylvania 34%, and New Jersey wants to tax sports betting at casinos and racetracks at 8% and online sports betting at 12%. Estimates indicate that by the end of 2018, eight or nine states will have permitted the full gambit of sports betting which may grow to 12 or 14 by the end of 2019.
Who Wants a Piece of the Legal Sports Betting Pie? In addition to the obvious beneficiaries, casinos, racetracks, and online wagering websites, there will be a slew of new opportunities for nascent and legacy companies alike. Even companies like YouTube, Twitter, and Facebook may see new revenue streams. Many sports leagues, including the NBA and MLB, are looking to collect a 1% fee on bets placed on their games. Naturally, sports operators and sportsbooks insist that the games would be in operation regardless. The casino lobby also opposes the fees. The American Gaming Association, which advocates for the casino industry, has indicated that this 1% fee would actually equate to 20% of revenue generated by sportsbooks since they keep only 5% of wagers after paying out to winners. Increased Sports Viewing Popularity and Ad Spend The average NFL fan who is a non-bettor watches about 15-16 games a year while the average NFL fan who is a bettor watches 45-50 games. Thus, allowing viewers to legally become sports bettors will make them more likely to watch sports. Sports consumption and engagement is likely to increase since fans might have a new, vested interest in outcomes, which will lead to increased advertising spend. For example, British betting companies are estimated to put 20-30% of revenue back into advertising. New Opportunities for Startups and Existing Giants Alike. Sports outlets that already discuss gambling lines can now monetize it through subscriptions or ads, or even reap rewards for affiliate link advertising that sends fans to sportsbooks. It'll also likely create a new world of content including statistical analysis and news. Existing companies in the space have likely been anticipating this outcome, building their technology and user base in preparation. Take for instance in-game sports betting startup WinView, which allows fans to make free wagers in real time and can leverage its existing base of 130,000 users. The potential for sports betting legalization was also likely a major impetus for Turner Broadcasting's decision to allow NBA fans to stream live games a-la-carte. How Will FanDuel and DraftKings Respond? It's hard to say whether the fantasy sports customer base overlaps much with traditional betting, but they will face more competition with casinos and sportsbooks. For now, it seems they are open to new opportunities. DraftKings can leverage its existing 10 million users and plans to release a sports betting product shortly. Irish bookmaker Paddy Power Betfair is currently in merger talks with FanDuel, in an effort to establish themselves in the US betting market. They're currently offering less than $1 billion. Effects on eSports. There's disagreement around whether legal sports betting will benefit or detract from eSports. Some believe that legalized sports wagering could detract from it, which has to some degree served a replacement for legal sports betting. The new ruling could introduce more competition for these categories, especially if they are drawing from the same customer base. However, others contend that eSports gambling would provide more engaged viewers and increased spend for team owners and broadcasters, just as it does in traditional sports. Some eSports companies have anticipated the legalization of sports betting and planned accordingly. Ethical Considerations. The legalization of sports betting has sparked ethical concerns about the integrity of sports outcomes. College athletes are considered the most vulnerable to corruption because they don't get paid. Still, the National Collegiate Athletic Association (NCAA) has suspended its policy of not holding championships in states where sports betting is legalized. Will Sin City Suffer? Las Vegas, Nevada, likely will not lose out too much in response to this ruling, since only 2.5% of its earnings are from sports wagering. However, the nation's largest sporting leagues are starting to move its franchises to Sin City, after eschewing it for years because of the temptations of sports gambling. In the last Super Bowl when the New England Patriots faced off against the Philadelphia Eagles, Americans bet a staggering $4.76 billion on the game. 97% of that figure was done so illegally. However, this will likely change by the time the next Super Bowl rolls around. In a hotly anticipated move on May 14, 2018, the US Supreme Court struck down the 25-year-old Professional and Amateur Sports Protection Act (PASPA), paving the way for states to legalize sports betting. Until that point, Nevada has been the only state with legal single-game wagering, and more limited state-run sports lotteries in Delaware, Oregon, and Montana. From investor to casual participant, betting enthusiast, or ardent protestor, you’ll want to understand the buzz. This article will cover the foundations of sports betting, including its $150 billion market size, implementation timeline, and revenue distribution. It will also examine the implications of its legalization, including increased sports engagement and popularity, ethical concerns, fresh opportunities, and its impact on fantasy sports and eSports. Almost all professional sports have betting activity, and the type of betting varies. Betting can extend beyond simply choosing winners and losers of a game (the “money line”). Bettors can also bet on the “point spread,” the number of points by which one team is favored over the other, or even on the “total,” when the bettor bets over or under the total amount of points scored by both teams. Even more sophisticated options for betting include parlays, bets on two or more teams or selections, and futures, a wager that will be determined in the future. Sports betting is legal in many parts of the world, including Australia and western Europe, with the largest legal market in the U.K. However, even when it’s not legally permitted, the market has flourished – there are $1.8 trillion illegal wagers worldwide, largely in unregulated markets and on illegal betting websites. According to 2014 research, over 80% of sports bets are placed on the black market globally. There are currently hundreds of betting sites and apps that allow bettors to wager, which has led to the emergence of blockchain as a discrete exchange of money and to improve on the current system. For example, digital currency Electroneum aims to have its token be used by online gambling services while platforms like HEROcoin want to decentralize sports betting. Since sportsbooks usually charge high fees and end up with the housing winning, new platforms like HEROcoin offer peer-to-peer betting and provide transparency in the flow of money and terms. In the U.S. alone, illegal sports wagers are estimated to reach between $50 to $150 billion. For the sake of comparison, Nevada, the only U.S. state that had allowed sports keepers, recorded $4.8 billion in 2017. And, consider that Britain, with a population of 65 million and a far less diverse sports market, yielded $20 billion in wagers for the 2017 fiscal year. Worldwide, the most popular sports to bet on are professional football and basketball (see below). Before we continue, it’s important to clarify the terms fantasy sports, daily fantasy sports, and traditional sports betting. Both fantasy sports and traditional sports betting are popular forms of gambling based on sports outcomes, but there are key differences. For one, fantasy sports betting is legal. And, in fantasy sports, your opponents are other human players, rather than bookmakers like in traditional betting. In fantasy sports, a group of human players, called a league, select from real-life athletes to create imaginary teams. Based on the performance of each athlete throughout the season, the team is allocated points. To win, your team must have won the most points throughout the season, which typically lasts for a few months. A popular subset of fantasy sports is daily fantasy sports (DFS). DFS lasts for a day instead of a season. In the morning, you draft your players, and you’ll know who won when the games are complete later that afternoon or evening. While leagues in regular fantasy sports are typically comprised of friends, with DFS you compete with random people you are matched with. The winning pot can reach millions of dollars. While fantasy sports has been legal, daily fantasy sports has operated in a more of a grey area. Fantasy sports was legalized in 2006 because it is primarily an activity amongst friends, not about wagering money, and is a game of skill instead of chance. In addition, players find out whether they win or lose in a matter of months—not in minutes or even seconds as is possible in traditional gambling. DFS, on the other hand, has neither of those arguments working for it. Later in this article, we will discuss the two largest DFS sites, DraftKings and FanDuel. The ruling applied to a case brought by New Jersey, which has promised to be implemented by June 2018. However, other states will need to consider the issue for themselves. States certainly have an incentive. Legal sports betting would provide additional tax revenue, based on income tax on winnings or as an excise tax on casino revenue less those winnings. The American Gaming Association has predicted that if passed in 40 states, it could generate $8 billion in local taxes, create hundreds of thousands of jobs, and add $20 billion to the GDP. However, there will be many licensing, taxing, as well as potential demands from leagues to sort out. Specifically, states will also have to consider who to tax, and what the appropriate rate is. Nevada currently imposes a 6.5% tax, while Pennsylvania has enacted a 34% tax, and New Jersey wants to tax sports betting at casinos and racetracks at 8% and online sports bettors at 12%. 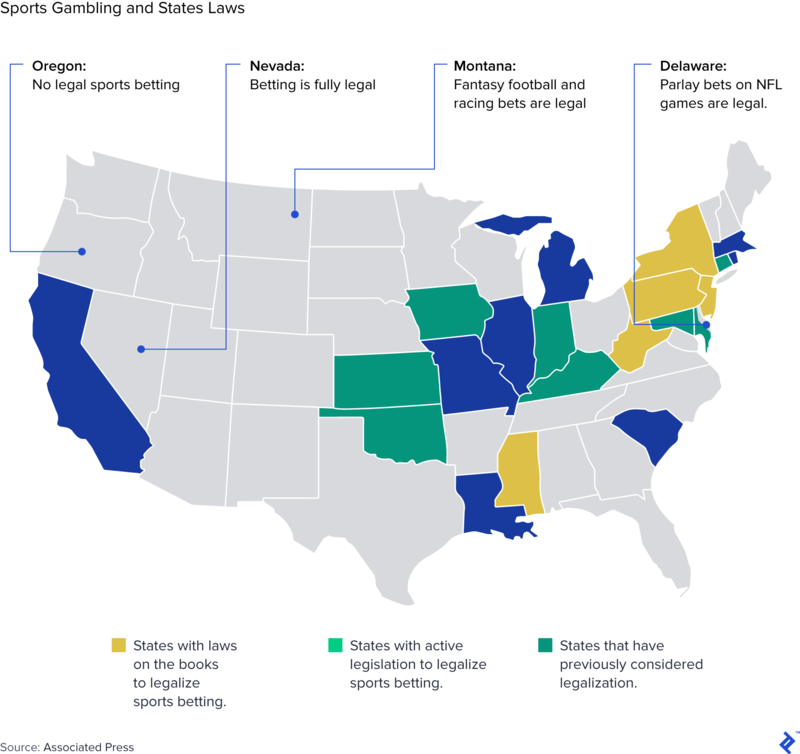 States will also need to figure out where to allow gambling and whether to permit online betting. Another factor to consider is who to revenue share with, such as with sports leagues, individual teams, and with bookmakers. According to ESPN, conservative estimates indicate that by the end of 2018, eight or nine states will have permitted the full gambit of sports betting at casinos, racetracks, and other locations–which may grow to 12 or 14 by the end of 2019. Still, regulation is hardly final. Both the NBA and NFL have asked Congress to pass federal legislation to standardize regulation, versus fragmented laws from 50 states. In addition to the obvious beneficiaries, casinos, racetracks, and online wagering websites, there will be a slew of new opportunities for nascent and legacy companies alike (to be discussed later). Even companies like YouTube, Twitter, and Facebook may see new revenue streams. Significantly, sports leagues are seeking their slice of the pie. Many leagues, including the National Basketball Association (NBA) and the Major League Baseball (MLB), are looking to collect a 1% fee on bets placed on their games. This is part of a larger push by leagues for “integrity fees,” with leagues arguing that sports betting is a derivative of their games and that they will have to invest in monitoring and investigating ethical concerns consequent of sports betting. Naturally, sports operators and sportsbooks insist that the games would be in operation regardless. The casino lobby also opposes the fees, contending that the leagues will already benefit from the increased interest and engagement with games. The American Gaming Association, which advocates for the casino industry, has indicated that this 1% fee would actually equate to 20% of revenue generated by sportsbooks since they keep only 5% of wagers after paying out to winners. Consider this fact from recent Nielsen research: “The average NFL fan who is a non-bettor watches about 15-16 games a year. The average NFL fan who is a bettor watches 45-50 games a year.” And, according to the same study, sports bettors made up 25% of the NFL’s TV audience in 2015 but accounted for 47% of all minutes viewed. Thus, it stands to reason that allowing viewers to legally become sports bettors will make them more likely to watch sports. This ruling is a welcome change for the sports television industry, which is facing pressure from streaming services, social networks, and video games. Many sports fans, including “cord-cutting” millennials, haven’t historically been able to view games without cable subscriptions. With this new change, sports consumption and engagement is likely to increase since fans might have a new, vested interest in outcomes. Hyper-engaged fans will likely lead to an increase in advertising spend. For example, British betting companies are estimated to put 20-30% of revenue back into advertising, mostly on television. Legalized sports betting will likely lead to a surge of new services and applications from both VC-backed tech startups and legacy media companies. Sports outlets that already discuss gambling lines can now monetize it through subscriptions or ads, or even reap rewards for affiliate link advertising that sends fans to sportsbooks. It’ll also likely create a new world of content including statistical analysis and news. As NeimanLab notes, there’s going to be a seismic shift from sports reporting for entertainment purposes to “production information”—content one reads to help one make more money. Just as reading the Wall Street Journal helps stockbrokers choose better stocks, sports analysis will help bettors make smarter, more informed sports betting. For example, popular sports site Bleacher Report might transform into a platform for programming shows and statistics for bettors. Existing companies in the space, both large and small, have likely been anticipating this outcome and potential changes to the business model, building their technology and user base in preparation. According to CNN, “We’ve already seen a lot of companies prepare for a world with legal sports betting, but now the shackles are off with the legal clarity offered by the Supreme Court.” Take for instance in-game sports betting startup WinView, which raised $12 million in its latest round of funding—the company allows fans to make free wagers in real time and can leverage its existing base of 130,000 users. And, it wouldn’t be terribly surprising if artificial intelligence sports prediction startups such as Stratagem and Unanimous A.I. see a boon from the move. The potential for sports betting legalization was also likely a major impetus for Turner Broadcasting’s decision to allow NBA fans to stream live games a-la-carte, allowing fans to watch games at a prorated price instead of paying for the full cable subscription up front. How Will FanDuel and DraftKings Respond? It’ll be interesting to witness how legal sports wagering will affect fantasy sports, and market leaders FanDuel and DraftKings specifically. In 2017, the two comprised roughly 90% of the $320 million in revenue generated from fantasy sports. FanDuel was founded in 2009, and DraftKings three years later in 2012; they were darlings of the venture capital world, raising $400 million and $700 million respectively. By 2015, the companies launched aggressive marketing campaigns, with DraftKings spending $156 million on TV commercials and FanDuel even more. However, the ads garnered the attention of more than fans; regulators responded by forcing them to lobby state-by-state for legal approval (today, FanDuel operates in 40 states while its competitors operate in 41). Drained from the battles, the companies planned a merger—only to be thwarted by the FTC, eventually dropping the cause. So, what to expect with the new ruling? For one, it’s hard to say whether the fantasy sports customer base overlaps much with traditional betting. According to a survey conducted earlier this year, three-quarters of daily fantasy players said legal sports betting would have little to no impact on their fantasy spending. While fantasy sports typically requires more skill and analysis, sports betting is more of a casual enhancement to typical sports consumption. Irish bookmaker Paddy Power Betfair is currently in merger talks with FanDuel, in an effort to establish themselves in the U.S. betting market. They’re currently offering less than $1 billion. Since UK sports betting regulation is projected to clamp down on amounts customers can stake, opportunities in the U.S. market have become more appealing and deals like these could become more plentiful. 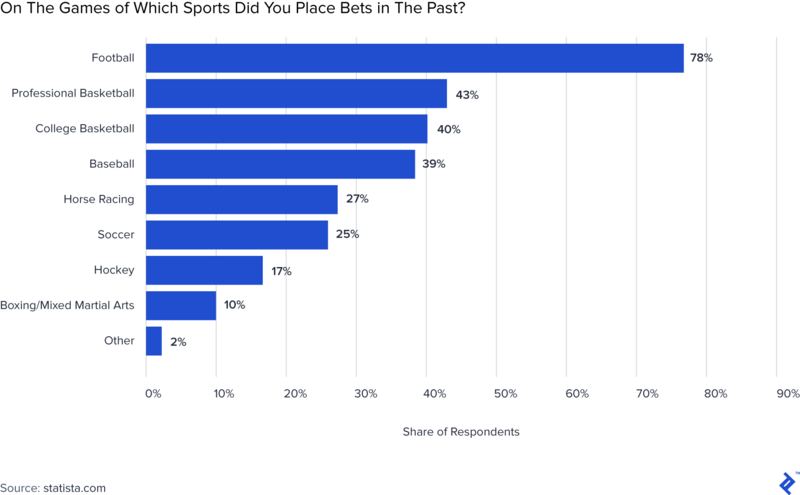 There’s disagreement around whether legal sports betting will benefit or detract from eSports, multiplayer video games played competitively (typically by professional gamers) for spectators. Some believe that legalized sports wagering could detract from eSports and daily fantasy sports, which have to some degree served a replacement for those interested in making predictions about sports outcomes. The new ruling could introduce more competition for these categories, especially if they are drawing from the same customer base. However, others contend that eSports gambling would provide more engaged viewers and increased spend for team owners and broadcasters, just as it does in traditional sports. Some eSports companies have anticipated the legalization of sports betting and planned accordingly. Unikrn, founded in 2014 and backed by investors such as Mark Cuban and Ashton Kutcher, is a web platform where users can bet on esports matches that has raised $10 million in equity financing and $80 million from its 2017 sale of Ethereum-based cryptocurrency. According to cofounder and CEO Rahul Sood, “We felt that fantasy was operating in a loophole and it was unsustainable, so instead, we focused on building technology around sports betting knowing that the U.S. would eventually come around. And we effectively built a technical motor on Unikrn that put us light years ahead of anybody else in the space. So, we’re excited about this.” Soon, Unikrn will be able to sell to its U.S. users, which represent 40% of its user base, and who currently bet on games using a valueless virtual currency. Still, the National Collegiate Athletic Association (NCAA) has suspended its policy of not holding championships in states where sports betting is legalized. This move comes in opposition to its existing hardline stance against betting. Previously, the NCAA has banned sports gambling amongst its members and has plastered posters outside NCAA tournament locker rooms warning athletes not to bet, lest they lose their eligibility for a year. However, the NCAA’s practice of restricting sports betting advertising at tournaments will continue. Las Vegas, Nevada, likely will not lose out too much in response to this ruling, since only 2.5% of its earnings are from sports wagering. However, the nation’s largest sporting leagues are starting to move its franchises to Sin City, after eschewing it for years because of the temptations of sports gambling. The National Hockey League (NHL) is responsible for Las Vegas’ first big team, the Golden Knights, which is enjoying success in its debut season. In addition, the NFL franchise, the Raiders, is set to arrive in 2020. On a commercial level, it’ll be interesting to observe this new U.S. economy rooted in a vice, similar to the legalization of marijuana and the end of prohibition. The new opportunities and offerings for companies large and small will likely come to light soon, though as a society we should remain aware of the ethical and health ramifications of legal sports betting. What does DFS stand for in fantasy sports? A popular subset of fantasy sports is daily fantasy sports (DFS). DFS lasts for a day instead of a season. While leagues in regular fantasy sports are typically comprised of friends, with DFS you compete with random people you are matched with. The winning pot can reach millions of dollars. Is it illegal to bet on sports in the US? As of May 14, 2018, it is no longer illegal to bet on sports in the US outside of Nevada. While New Jersey will likely implement by June 2018, other states will need to consider the issue separately.